Having worked in the IT industry for 16 years, I have been lucky enough to come across a number of technologies and platforms that I would describe as transformational. The first revolution I was involved with was virtualisation. I’ve always been a person looking to improve on a process, to grow and evolve. I was able to champion the wave of virtualisation that revolutionised internal delivery of server and compute resources. The next great shift in the industry that I moved to adopt was cloud. Cloud has transformed the IT and business irreversibly. It fuelled the DevOps movement and a new era of speed, efficiency and innovation. With the world truly moving at hypersonic speed, it’s very easy to end up with complex, siloed and disjointed systems with no simple method to get visibility across different technologies and verticals. Security and customer experience are also top concerns today, and addressing these challenges is commonly no simple undertaking. I like to think of Splunk as providing a new datacentre layer, a search platform on which you can connect and visualise across the enterprise, and one that does this with great simplicity and potentially unlimited capability. A Google search for your business that will give you insights that could revolutionise many aspects of what you do today. Like the other technologies I have discussed, I feel the same sense of anticipation and see the same waves been generated in the undercurrent of the IT industry with Splunk. Its growth has slowly gained traction slowly over many years. I have seen it appear and proliferate more and more in the enterprise through to small to medium businesses. Today, Splunk has now passed 1B$ revenue, joining the elite short list of IT organisations to reach this value. But they have no desire to stop there. Splunk is now on a roadmap to 5B$ revenue, and based on my recent experience of working with their sales strategy I believe they will get there. I have just returned from the 7th Annual Splunk Worldwide Users’ Conference held at Walt Disney World, Orlando, Florida. 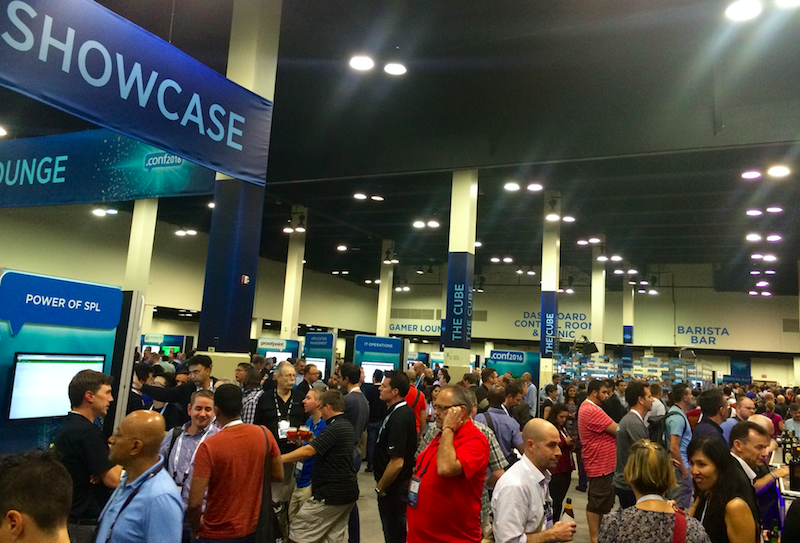 A coming together of some 5000 customers, Splunk knowledge experts and business people. The conference was a great showcase of the rise and strength of the Splunk platform, their partners, wider ecosystem and its community. Key topics for the keynotes sessions were Digital Transformation, Transforming Security, a new release/version of Splunk Enterprise (their core product), Splunk Cloud, and delivering IoT (Internet of Things) analytics. The Splunk ecosystem has grown up and diversified and seems very healthy indeed. The product has now matured and broadened into areas that are currently both top priorities and challenges for the organisation of today. Splunk, which is able to ingest machine data from any source, is perfectly placed to deliver on these challenges. A common concern with Splunk is price. The licensing model is based on data ingestion which can be significant if done without some prior thought, planning and design in the process. This has led to the proliferation of alternate stack-based solutions built with different open source tools. While other tools are available, I believe that Splunk – when used for multiple use-cases such as Operational Intelligence, Security, Mobile Application Performance Monitoring, User Behavior Analysis and Business Transactions – is the clear market leader and choice for building out a universal platform. It can deliver on both current and future requirements without needing to be completely replaced or redesigned. A universal platform – ingest machine data from any source, from log files in operations and wind farm data to IoT metrics from a kitchen device. Indexing data on the fly – saving you the common problem of building complex models yourself. Visualisation and analytics – this is both rich and extensible, massively reducing mean time to value, an important item on everyone’s agenda today. Splunk is well placed to continue its growth, ultimately because the product appeals to and solves problems for technical IT staff, business owners, data scientists and commercial organisations alike that use IT and are looking to run their operations more effectively or efficiently. Other solutions in the marketplace may address some challenges, but ultimately will fall short at some stage when extending the scope. A number of exciting new announcements were made at this year’s conference. These included a new version of the core product offering and new capabilities within some of the wider parts of the product suite. A lot of interest was piqued on a new licensing model and the introduction of a free 50Gb allowance for development and test environments. Most excitingly was the demo from Insight Engines of the new capabilities with enterprise search in a human, natural language. The possibility of asking any type question of your data in a very simple way paves the way to dramatically increase both the number of people that can ask those questions and the insights that are uncovered. I believe the enterprise of today can no longer afford not to have Splunk. Splunk has a saying that “use cases are only limited by your imagination” and in the context of attempting to explain some of those in this post, I think that quote tells a better story. The organisations of tomorrow will not be able to compete and offer their customers, both internal or external, the same level of insight with those that are Splunk enabled. Email hello@avocado.com.au to find out more about Splunk and what it can do for your business.